Nutritionist Dr. Susan Mitchell tells Oprah that chocolate is the number one food that women crave. Men often crave the sweet treat too. There's no reason why you can't enjoy chocolate in moderation, but understanding why you crave it can help you make healthy choices when it comes to indulging. You know how good chocolate tastes, so wanting a hunk of it is likely because you just want to enjoy its flavor. According to research presented at the International Congress on the History of Science, Technology and Medicine at the University of Manchester and reported by BBC News, the creamy, sweet taste of chocolate is part of the reason why people crave it so much. Combined with the aroma produced by chocolate, people might find themselves craving it simply for the pure pleasure and flavor of it. One of the primary reasons why you crave chocolate has to do with your feelings about it. According to Dr. Amy Jo Stavnezer in Psychology Today, eating chocolate makes you feel good, so you naturally want it. Some people crave chocolate when they're sad or feeling down. The reason lies in your brain. Consider the following, courtesy of Psychology Today, to understand how this works. When you eat chocolate, your brain releases dopamine, a feel-good chemical released when you're enjoying something. Dopamine courses through your frontal lobe, hippocampus and hypothalamus, all of which are parts of the brain that control emotions. The feel-good components of chocolate, which include caffeine and theobromine, are pleasurable when combined with the feel and taste of chocolate in your mouth. When you encounter something that makes you feel good - in this case chocolate - you want to recreate those feelings by gaining access to the pleasurable thing as often as possible. So, if you associate chocolate with feeling good, you may crave it when you want to heighten your mood or keep a good mood going. Are you the type of person who rewards yourself with a delicious treat? Many people celebrate accomplishments and good news by enjoying a meal or a dessert. If your go-to treat is chocolate, you may naturally begin to crave it anytime something good happens, says Stavnezer. This goes back to the release of dopamine in your brain. If a celebration makes you think about chocolate, eating it can make the event feel more enjoyable and celebratory. According to medical experts at Columbia University, many women crave sweet treats, including chocolate, in the week before their period. While the exact reason is unknown, experts feel that it goes back to the good feelings that eating chocolate evokes. When a woman is feeling achy, tender or has a low mood, consuming chocolate can help her survive the monthly arrival of the menstrual period. The following are things to consider if you're a woman who craves chocolate with PMS. Some feel that PMS cravings indicate the need to increase certain nutrients, such as iron, magnesium, carbohydrates or calcium. However, research published in Physiology and Behavior indicates that supplementing with those nutrients independent of chocolate doesn't have a significant role in decreasing cravings. Mood is often affected during PMS, so eating something that makes you feel better can make you begin to crave that item each time you have PMS. For many women, that's chocolate or a similar sweet treat. In general, filling up on chocolate isn't a healthy choice, so be sure to balance your chocolate cravings with plenty of healthy foods to replenish the nutrients - particularly iron - that are lost during menstruation. A habit can be a hard thing to break. For some people, eating chocolate at certain times becomes a habit, but running out or not having access to chocolate at that time can leave you with a craving. For example, if you always have a chunk of chocolate while you watch the evening news or snack on chocolate when you drive to the mall or church, but one day don't have any chocolate, you might find yourself craving it. According to the National Institutes of Health, keeping a food journal can help you detect your chocolate eating habits so you can make healthier choices. Dark chocolate has many health benefits, including its high content of antioxidants. Milk chocolate is generally higher in sugar and fat. Provided you only indulge in chocolate once in a while, there's no need to feel guilty about giving in to a craving. 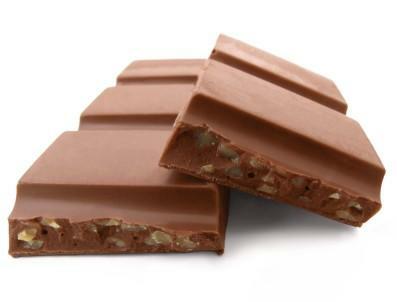 Eating too much chocolate can lead to weight gain due to the calories that chocolate contains. If you need to cut back, use the following tips from Columbia University. Make the bulk of your chocolate intake in the form of dark, high quality chocolate so you can reap the benefits without worrying about the high levels of fat and calories found in other types of chocolate. Slowly cut back on chocolate so you don't feel deprived. Have a healthier sweet treat, such as fruit or frozen yogurt, when a craving for chocolate hits. Wait a few minutes to see if the craving passes. Distract yourself with something enjoyable, such as watching your favorite television show, talking to a friend or taking a walk. Cutting back takes some effort, but eating chocolate in healthy doses allows you to enjoy a favorite treat without going overboard.